The British Isles. The Islands of Britain. If you’re an Irish nationalist or republican- the archipelago off the North-West coast of mainland Europe formerly known as the British Isles (source: the Sinn Fein dictionary of Newspeak, 13th edition). A group of over 6,000 islands, many of which are inhabited, many of which are uninhabited. The two largest islands are commonly known as Great Britain (because it is the biggest), and Ireland, although I prefer to use the less common titles of East Britain and West Britain (and no, I’m not joking). These islands are subdivided into six distinct nations. 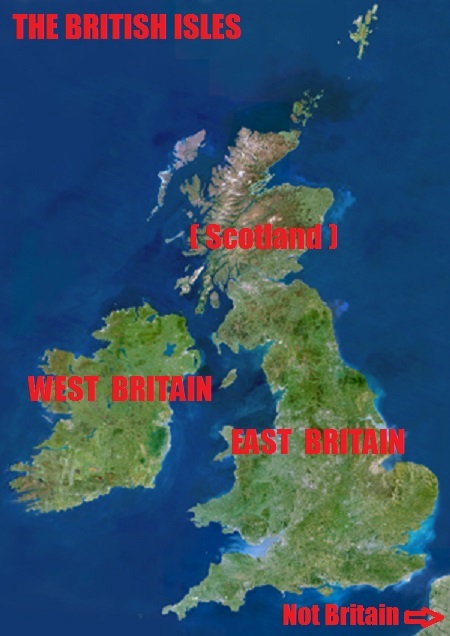 East Britain is made up of England, Scotland and Wales. The more westerly island is made up of Eire and Ulster. The tiny island nation of Vannin (the Isle of Man) lies between the two. If one includes the Channel Islands, and there are arguments for and against doing so, the number of nations rises to 8. If one recognises Cornwall/Kernow as a distinct nation, and many do, that number rises to nine. The United Kingdom governs most of the British Isles. Eire has been an independent country since the early 1920s. The Isle of Man and the Channel Islands of Guernsey and Jersey are not part of the United Kingdom, they are British Crown Dependencies, ergo- British but not part of the UK (Irish nationalists will, by now, be furiously scratching their heads!). Lord, Save me from the Hypocrites! As an Ulster Loyalist I am loyal to the land of my birth, Ulster (pay attention at the back there). I regard my native land as being a distinct nation, a nation which (as the polity of Northern Ireland) is part of the United Kingdom because the majority of it’s citizens wish it to be so. I, like the majority of my compatriots, believe that Ulster’s membership of the United Kingdom is beneficial to our material well being. I do not believe that that membership is a prerequisite of my country’s existence, nor do I believe that the UK is somehow a ‘spiritual’ or undissolvable union. My primary loyalty is to Ulster (as it has existed since 1921, ie. the six county Ulster model of the modern era). I reject the idea that Ulster should be subsumed into a monocultural 32 county Irish state, not because of any enmity or prejudice against Eire or it’s citizens, but because the idea is anathema to me as a patriotic Ulsterman. I would be just as opposed to any proposed annexation if our neighbours on this island were the Dutch or the Swiss! I would also be naturally opposed to any effort by England to supplant Scottish culture, rewrite Scots history and/or fully ‘integrate’ those two nations into one. 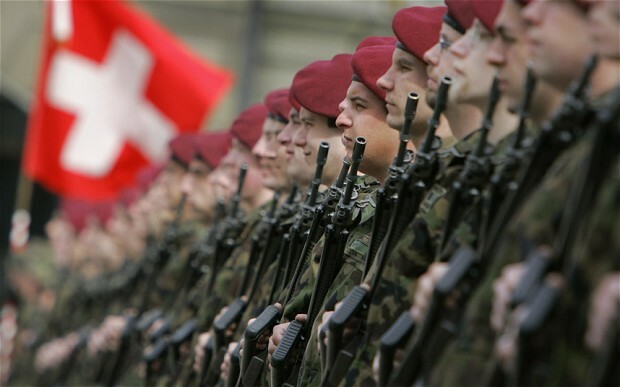 Admit it, this isn’t really how you imagined the Swiss army, is it? I regard the United Kingdom as a family of nations. But a family held together, not by inflexible bonds of iron, but by more subtle ties. Common outlook, common language (more or less), common history and common values. Should one part of that family of nations decide to go it’s own way and to break the ties which bind our countries together, then so be it. The rest of the family will simply carry on. No island, no landmass, is preordained to be a single, unitary political entity. Islands do not equal nations. Scottish independence will not make me, or Ulster, any less British. The people of the UK are of course British by birth, but in another way, a more intangible way, we are British by choice. Is it not then also valid to choose not to be British, if that is how one feels? And is it not also correct for each part of the Union, each nation, to have the right to self-determination? A Union held together by force or coercion is not a Union I would want any part of. In the event of a ‘Yes’ vote, the people of Ulster and the people of Scotland will still be close relations. Political decisions, no matter how momentous, cannot alter thousands of years of history and kinship. I will still visit the Scottish branch of my family in Stirling, I will still welcome Scots into my home each July. I might even chance my arm and try to get a Scottish passport (one can never have enough passports!). An independent Scotland may even have unexpected benefits for Northern Ireland, after all, those nuclear submarines have to be based somewhere, and Lough Foyle is as good a place as any. It is my sincere hope though that this referendum is decisive, one way or the other. Is a 51-49% split a clear indication of the will of the people? Can Scotland transition to independence if, for example, 47% of the population didn’t want, or vote for, independence? There is another issue here too. If independence is rejected, then surely it is time for a constitutional modernisation of the United Kingdom? A redefining of relationships between constituent countries, a reassertion of the inalienable rights of individual nations and the updating of the UK’s written constitution (contrary to popular belief the United Kingdom does have a written constitution: the Magna Carta Libertatum of 1215). And is it not time for English devolution? The UK has always been a federal entity in all but name, it is high time for our federation to be codified and it’s articles of association to be made clear. Oh Alex, you’re making this all far too easy. People will start to think you want to have the “pish ripped clean outta ye”. The Scottish people should use their votes and use them wisely. People in other nations that constitute a part of a larger union or federation will never get a vote on their countries future. Wars have been fought for such things. Remember Biafra- http://www.bbc.co.uk/news/world-africa-20801091. One could argue that the American Civil War was about the right of constituent states to secede (or not), a conflict that cost over 600,000 lives and tore apart a continent. Whatever the rights and wrongs of the argument, it will at least be settled at the ballot box, not on the field of battle. I wish my Scottish brothers and sisters well, whatever they decide. The choice is theirs and theirs alone. I will not wax lyrical about British identity, I will not use sentimentalism to argue for Scotland’s continued membership of the Union. Scots should vote with their heads, not their hearts, for Scotland will always be in their hearts, as Ulster is in mine. They will always have Scotland’s best interests at heart, simply because they are Scots. Therefore the choice must be made with cool head rather than warm heart. What is best for Scotland? Separation or Union? The Scots must decide. 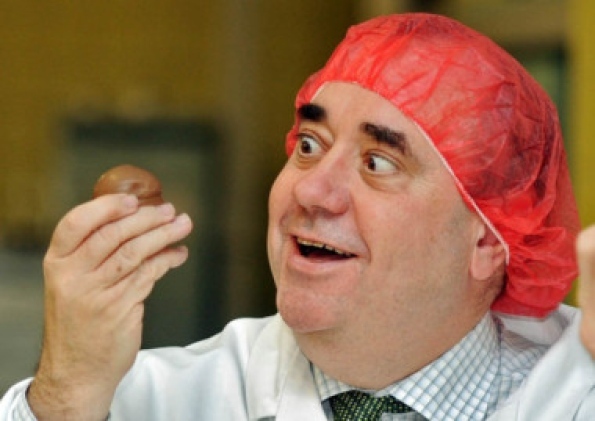 The rest of us must await the outcome of that decision, but I will leave you with my prediction- when all the votes are cast and counted, I believe that Scotland will say: “Naw thanks”. Ian Paisley had the same views of the Scottish people having the right to decide their own destiny. Sounds pretty democratic to me.